Eventually, he found out. Older teenagers in the neighborhood introduced him to blues and classical music, and he started to read books with more diversity—in other words, works of art that were distinctly non-Irish. He went to modern-art galleries in Dublin, wandering the permanent collections to view pieces by internationally acclaimed artists, wondering: Why would this artist from that country express that idea this way? How can that person be so different from me yet I can still understand what they’re saying? All these years later, Cotter, 53, is still asking the same questions—and enlisting the help of individuals who are uniquely qualified to answer them—through Articulate with Jim Cotter. The 30-minute “un-arts” show, which is produced out of Stotesbury Mansion in Rittenhouse Square, is seen on 115 PBS stations across the country, including WHYY-TV in Philadelphia. The show’s central tenet: Artists can help to explain the world around us, and their art connects us all. A few examples of past episodes: how “Party Hard” rock ‘n’ roll icon Andrew W.K. copes with feelings of pervasive dread; how composer Gerald Busby renewed his “lust for life” in the aftermath of his struggles with drug addiction and the heartbreaking death of his beloved life partner; and how crochet sculptor Caitlin T. McCormack uses her skeleton-like art to deal with humanity’s “greatest fear,” our own inevitable mortality. Furthermore, the show aims to spread the word that everyone—not just those who lean a certain way, politically speaking— can learn from an artist’s experiences and view of the world. He cites one episode, “Changing Minds about Climate Change,” in which he asks large-scale landscape artist Zaria Foreman about feedback she may receive from individuals who disagree with the science behind climate change. “She said, ‘What’s the harm in taking precautions? What’s wrong with being a little cleaner?’” he recalls. “I thought: That’s the right answer. … A TV show isn’t going to mend the world, but I think the artists we feature, with the way they think about the world, you’re almost going to change people’s minds one by one. Cotter admits he’s no art expert. If anything, he says, he’s “a bluffer” who hates to feel ignorant. This “magic” might come from the brush of accomplished painter or the hands of a great musician; he even sees it in craftsmen—say, someone who has the skill to refinish a pool table. Their works may be beyond his ability, and even beyond his understanding, but that doesn’t stop him from trying. A career in media began somewhat accidentally, almost comically, for Cotter—the son of a journalist (his father) and a teacher (his mother). When he was 14, he loved two things: soccer and radio. One day he rode his bike to a charity soccer match between two radio stations. When one of the goalkeepers went down with an injury, Cotter stepped in and played well enough to help his team win the match. The team invited him back to the station to celebrate, and this “foot in the door” was all he needed. Shortly thereafter, he began working at the station, learning the ins and outs of radio. 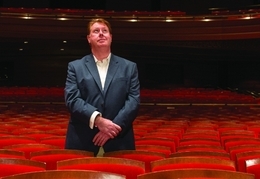 In Philadelphia, Cotter got a job at Temple University’s classical and jazz station, WRTI. There, he had his own radio gig, Creatively Speaking, which was something of a radiobased precursor to Articulate with Jim Cotter. He came into the show with fresh ideas, but he knew he certainly couldn’t do it himself. At the same time, he didn’t have the budget to hire a “seasoned” staff, so he turned to ambitious, creative-minded individuals fresh out of journalism school and film school—like Constance Kaita, his director of operations, and Tori Marchiony, his executive producer. Cotter’s 14-person team of writers, video editors and other staff work together to make 24 episodes per year—12 hours of television—and probably twice that amount of content exclusively for social media and the show’s website, ArticulateShow.org. Cotter credits much of the show’s success to his team, most of whom are in their 20s. In Kaita’s mind, each episode aims to have the editorial values of 60 Minutes and the production value of Hollywood. Like her fellow teammates, she appreciates the culture of personal and professional discovery, epitomized by the goal shared by the entire staff: “to continue to be embarrassed and amused by what we did six months ago.” To that end, Kaita’s creativity and stickto-it-iveness have helped her make great strides in booking increasingly prominent artists. One day, this conservatory-trained concert pianist hopes to run a nonprofit arts organization. Marchiony, for her part, has her eye on some national awards for Articulate with Jim Cotter. Furthermore, she wants the show to become the “preeminent arts media brand,” and not necessarily just in America. Most importantly, she wants the audience to feel respected by the content her team creates. 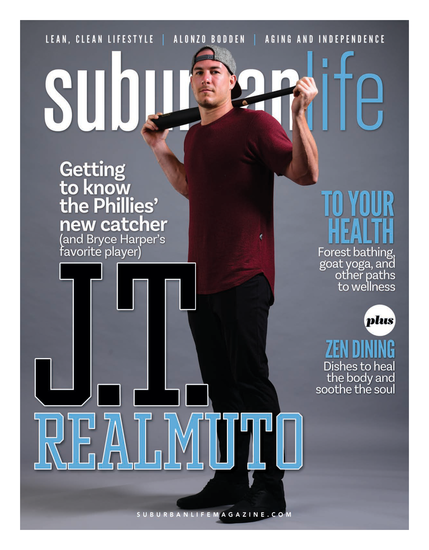 Published (and copyrighted) in Suburban Life Magazine, April 2018.